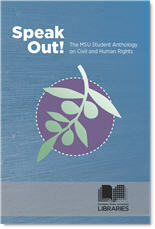 Our books are available through Amazon.com and through shop.msu.edu. You can also save the shipping cost and pick up your book at the Main Library MakeCentral. Send us an email by clicking Pick up at Main Library. We'll print your book and let you know when it's ready to pick up. Some books we print can be read for free online. Links are provided to copies digitized by the MSU Libraries and other organizations such as the Hathi Trust. Preview the next generation of cartoonists and comic artists! The MSU Student Comic Art Anthology presents never-seen work from students and recent graduates of Michigan State University. You'll find laugh-out-loud weirdness, surreal adventures, slice-of-life strips from the student perspective, and a fairy-tale remix or two. Features the work of Leslie J. Anderson, Fiona Avocado, Diana Busby, Gabriel P. Cooper, Matt Dye, Ryan Esch, Bridget Flanagan, Marie Lazar, Alisa Maiville, Spencer Thulin, and Stephanie Zang. Paperback, 80 pages, $12.00. The first volumes in the library's Comic Art Preservation Project, an effort to make classic comics more widely available to libraries, collectors, and fans. This Golden Age strip follows young adventurer Tim Tyler as he faces wild animals, dangerous criminals, and constant excitement as a member of the "Ivory Patrol" in Africa. Scanned from original proof sheets in the collections of the Michigan State University Libraries and reprinted with permission from King Features Syndicate. Paperback, 196 pages, $18.00. Cookery is one of the signature collecting areas at the Michigan State University Libraries. Our Michigan Cookbook Collection stands at more than 2000 volumes, and the Cookery collection overall exceeds 20,000 volumes. Seventy-five titles from our collection of historic American cookbooks were digitized in 2001-2003, with funding from the Institute of Museum and Library Services. The cocktail is a uniquely American beverage, and one of the most talented mixologists America ever produced was Tom Bullock. He tended bar at exclusive clubs in Chicago, Louisville, Cincinnati, and St. Louis, and continues to be a legendary figure among bartenders. From the amusing (Bizzy Izzy Highball) to the venerable (Mint Julep Kentucky Style), Bullock's creations are sure to please! Paperback, 53 pages, $13.95. The earliest cookbook written by an African American railroad chef, Rufus Estes, whose goal was “to prepare an ensemble that might, with equal grace, adorn the home table or the banquet board.” Originally published in 1911. Paperback, 142 pages, $13.95. With recipes for beat biscuits, plantation cornbread, creole chow chow, oyster gumbo soup and more, Mrs. Fisher is rightfully considered to be the earliest author of a soul food cookbook. First published in 1891. Paperback, 72 pages, $13.95. Pies and puddings, cakes and cookies – desserts were a specialty for the ladies contributing their recipes to the Charlevoix Cookbook! Try lemon biscuits, amber pie, apple tapioca pudding, angel parfait, grapefruit sherbet, peach whip, gold cake, Russian rocks, and nut cream fudge. There are a few recipes here for the main part of the meal, but the emphasis is definitely on sweets! Paperback, 121 pages, $13.95. Filled with mouth-watering favorites from days gone by! Includes recipes for creamed finnan haddie, Lady Baltimore Cake, Imperial salad, butterscotch pie, and fluffy ruffles candy! Paperback, 67 pages, $13.95. What was on the dinner table in Jackson, Michigan in 1921? Members of the Junior Dorcas Society answer this question with their favorite recipes! Try breaded mutton chops, baked corn, lemon raisin pie, and much more. Paperback, 165 pages, $13.95. New Crumbs of Comfort gathers together the favorite recipes of the ladies of St. Luke’s Church in Kalamazoo. Try crabapple jelly, maple mousse, bride’s cake, hot slaw, corn fritters, sour cream cookies, currant jelly pie, and much more! Paperback, 178 pages, $13.95. Mid-Michigan’s culinary history is preserved in The Pilgrim Cookbook, first produced in 1895. Enjoy champion bread, frothed eggs, pineapple float, sweet potato croquettes, corn salad, orange hash, honeycomb pudding, and much more! Paperback, 116 pages, $13.95. Railroads were an important part of Michigan's infrastructure even before the territory became a state, and this biographical directory identifies more than 7000 men (and a few women) who owned and managed Michigan's railroads in the first nine decades of their history. Graydon M. Meints, a longtime scholar of Midwestern railroad history, has gathered data from a broad array of primary historical documents, such as the annual reports of the Michigan Railroad Commission and scores of county histories. Paperback, 2-volume set, $32.00. Michigan Imprints is the completion of the Michigan portion of the WPA American Imprints Inventory, filling in the quarter-century gap between Preliminary Checklist of Michigan Imprints, 1796-1850 and American Book Publishing Record Cumulative, 1876-1949. The material was prepared for publication by LeRoy Barnett, a longtime scholar of Michigan history who worked for many years at the Archives of Michigan. Paperback, 4-volume set, $49.95. Since 1905, Michigan's territorial and state government offices have produced a vast number of published and primary source documents. Finding what one seeks in this mass of material has been challenging under even the best circumstances. Now, however, researchers have a convenient, comprehensive resource to identify more than 550 access tools for Michigan state government documents: indexes, bibliographies, literature surveys, finding aids and more. Of special interest are many unpublished indexes, which have been virtually hidden to scholars until now. Compiled by LeRoy Barnett, a longtime scholar of Michigan history who worked for many years at the Archives of Michigan. Paperback, 76 pages, $13.00. A charming account of Eduard Lindemann's student years at Michigan Agricultural College. A 1911 graduate, Lindemann was deeply engaged in campus life: active in athletics, editor of the student newspaper, and class treasurer. He went on to become a faculty member at Columbia University and a pioneer in the field of adult education. Paperback, 143 pages, $12.00. Originally published in 1915, William J. Beal's History of the Michigan Agricultural College explores MSU's early years in great depth, showing the roots of the world-grant university MSU has become today. Paperback, 519 pages, $28.00. For decades, the Spartan Women's League helped ease college students' entry to the world of adulthood with charmingly written guides to etiquette. Michigan State Manners reproduces the 1939 and 1956 editions from originals held in the University Archives & Historical Collections. Paperback, 72 pages, $9.00. The MSU Libraries have one of the world's finest collections on the history of veterinary medicine – more than 1400 manuscripts and rare books, from as early as the 15th century. This detailed catalog describes acquisitions through the year 2000. Author Henry C. Koch was chief bibliographer of the MSU Libraries until his retirement in 1986. Paperback, 309 pages, $24.00. 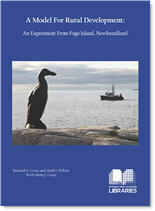 A Model for Rural Development: An Experiment from Fogo Island, Newfoundland, by Kenneth E. Corey and Mark I. Wilson with Marie J. Corey. A detailed case study on the rural development efforts, built on the geotourism approach, which are being undertaken at Fogo Island, a community of about 2,400 residents near the northern coast of Newfoundland, Canada. Kenneth E. Corey is professor of geography emeritus, and professor of urban and regional planning emeritus, at Michigan State University. He is also a former dean of MSU’s College of Social Science. Mark I. Wilson is professor of urban and regional planning in the School of Planning, Design, and Construction at Michigan State University. Marie J. Corey is a specialist emerita in the Department of Human Development & Family Studies at Michigan State University. Paperback, 242 pages, color illustrations, $22.00. In 1965, the Michigan State University Libraries were offered an unexpected opportunity: to provide a temporary home for the papers of Ivan Il’in, the noted Russian philosopher and legal theorist. This short volume describes the circumstances which brought the Il’in archive to Michigan, its preservation by the library, and its return to Russia after the end of the Soviet era. Bilingual text in Russian and English. Paperback, 51 pages, color illustrations, $20.00. Kyle Goldstein • When is Censorship Justified? Kenneth J. Williams Jr. • Racial Equality is a Myth! This handy blank notebook has a cover illustration of the MSU Main Library by student Adriana Abundis, class of 2012. Paperback, 60 pages, $8.00.